One of the things that I can often appreciate about these animated Batman movies is that they go back to his more comedic and entertaining roots. They are less story orientated and more focused on bringing you some good, simplistic entertainment. I however feel that in this case they overdid it. Story-wise it is a far too simplistic Batman outing, that besides feels hardly like a Batman movie at all. Make no mistake about it; this is a Harley Quinn movie, made to ride the wave of her newfound popularity. I won't say that Batman is barely in it, but...Well, OK he is barely in it. A real throwaway character, while Quinn constantly maneuvers herself into the spotlight. And nothing wrong with a good Harley Quinn movie, but just don't put Batman in the title if you are hardly going to use him- or any of his specialties. I am saying it more as a heads up, so you know what you are in for if you decide to go watch this movie. Problem I often have with these full length animated movies is that it often feels like they are the middle part of the trilogy, and I have never seen the first or final part of it. It always feels to me like I am missing some things, such as what happened to certain characters. Harley Quinn quit being a bad girl? OK, fine. But why not show how, why or when? Just little things like this that annoy me as a more casual viewer of these type of DCU animated movies. I am not into the whole DCU, I don't know every character and I don't keep myself up to date about any of them. Guess that in a way these movies are also more enjoyable for the fans, but I still do believe that these movies should take into consideration that not every viewer out there knows- and is up to date about everything about the DCU. More an annoyance than a true complaint about this actual movie, but don't worry. I still have plenty to complain about in regard to the movie as well. It is not like I hated watching this movie and it remains a quite good and entertaining one to watch if you have absolutely nothing better to do, but it also remains a flawed one, in many different ways. The story absolutely lacks some good suspense, mystery and excitement. For a Batman movie it certainly has very little action in it and the main plot line feels lackluster. 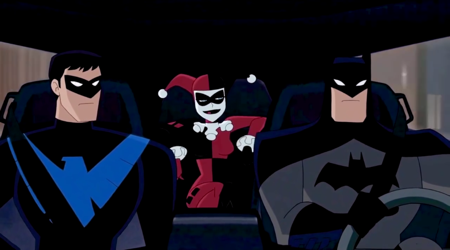 It basically for its first half is about getting Harley Quinn to team up with Batman and Nightwing, while the second is more about...Well, not much really. I like Poison Ivy as a character, but just not as the main villain in this movie. The whole villainous scheme is weak and it lacks gravity. A reason why the movie never feels all that tense, exciting or even very interesting to watch. The animation is quite good though. Not too bright, not too dark. A perfect balance, between both worlds. It still definitely remains true though that the movie is more comedy orientated than all about telling a very serious and credible story. This obviously mostly is due to the fact that it focuses mainly on the Harley Quinn character, who still works better as a comedic one than anything else really. A somewhat disappointing Batman outing, though most fans should still be able to appreciate and enjoy it.